조선 세종 때 신숙주, 최항, 박팽년 등이 왕의 명으로 편찬하여 세종 30년(1448)에 간행한 우리나라 최초의 표준음에 관한 책으로, 6권 6책이며, 활자본이다. 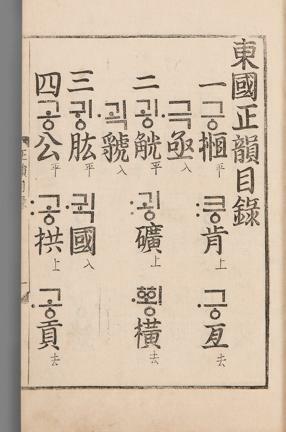 중국의 운(韻)에 관한 책인 『홍무정운』에 대비되는 것으로, ‘동국정운’이란 우리나라의 바른 음이라는 뜻이다. 당시 혼란스럽던 우리나라의 한자음을 바로잡아 통일된 표준음을 정하려는 목적으로 편찬, 간행되었다. 형태를 보면 본문의 큰 글자는 나무활자, 작은 글자는 갑인자, 서문은 갑인자 대자로 기록되어 있다. 구성을 보면 서문 7장, 목록 4장, 권1은 46장, 권 2는 47장, 권3은 46장, 권4는 40장, 권5는 43장, 권6은 44장으로 구성되어 있다. 크기는 가로 19.8㎝, 세로 31.9㎝이다. 특히 이 책은 동시 출간된 국보 제71호『동국정운』과 비교해 보면 다음과 같은 결론을 얻을 수 있다. 첫째, 개장(改裝) 당시 책의 천, 지를 약간 절단해 냈고, 둘째, 제목은 다같이 목판인쇄이나, 그 서체가 서로 다르다. 셋째, 책의 순서로 예, 악, 사, 어, 서, 수를 묵서했는데 이것은 뒤에 한 것으로 보인다. 이 책은 우리나라에서 최초로 한자음을 우리의 음으로 표기하였다는 점에서 큰 의의를 가지고 있으며, 국어연구자료로서의 중요성도『훈민정음』과 쌍벽을 이룰 정도로 높이 평가되고 있다. 또한 한자음의 음운체계 연구에 있어서뿐만 아니라, 훈민정음의 글자를 만든 배경이나 음운체계 연구에 있어서 기본자료가 된다. 이 책은 동시 출간된 국보 제71호『동국정운』과 함께 당시 음운학을 연구하는데 아주 귀중한 자료로 평가되고 있다. 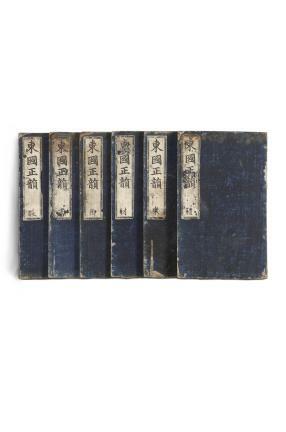 This is the country’s first book on standard rhymes composed of six volumes. 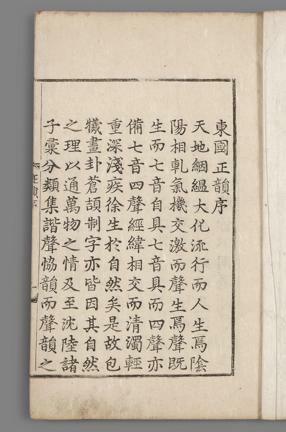 It was published using type printing in 1448 (30th year of the reign of King Sejong) by scholars such as Sin Suk-ju, Choe Hang, and Bak Paeng-nyeon at the King’s instruction. 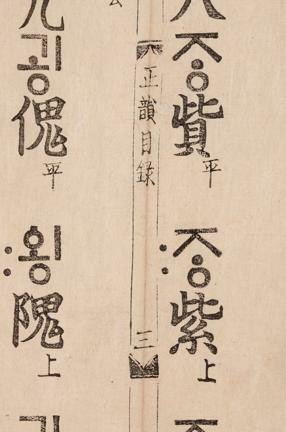 Dongguk jeongun was compiled to set a standard way to write down Chinese characters in Korean. 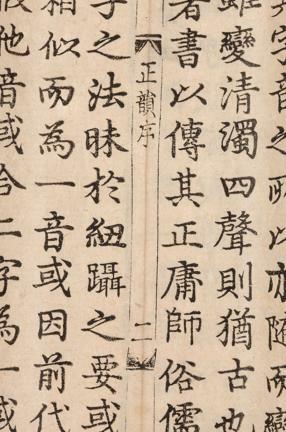 A similar attempt was made in China through the compilation of Hongwuzhenyun, a book on how Chinese characters should correctly read in Chinese. The book (19.8cm long and 31.9cm wide) is composed of the foreword (7 pages), contents (4 pages), Vol. 1 (46 pages), Vol. 2 (47 pages), Vol. 3 (46 pages), Vol. 4 (40 pages), Vol. 5 (43 pages), and Vol. 6 (44 pages). 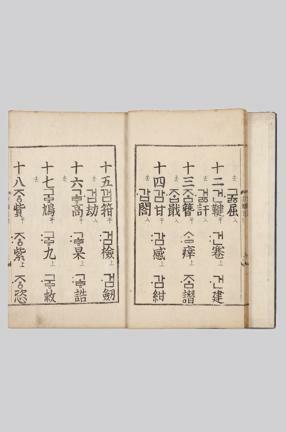 This book carries significance as the first attempt to write down Chinese characters in Korean. 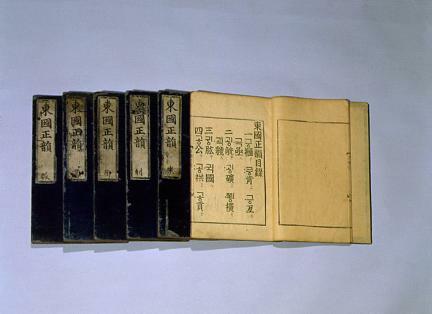 Experts speak highly of it as a material about research on national language, one as important as Hunminjeongeum. 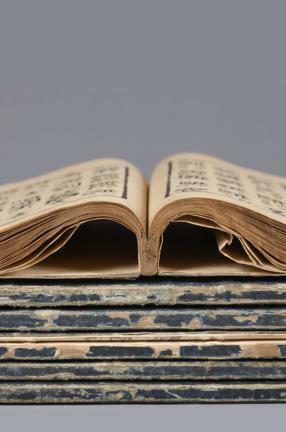 It is a basic material explaining how the letters of Hunminjeongeum (present-day Hangeul) were created and how its sound system is organized, serving as an important material for those studying the system of writing down the sound of Chinese characters in Korea.